Meet the outgoing and energetic Izzy! This sociable young lady strikes up conversations wherever she goes. When she isn't shopping at the mall, you may find her catching a movie with her friends. 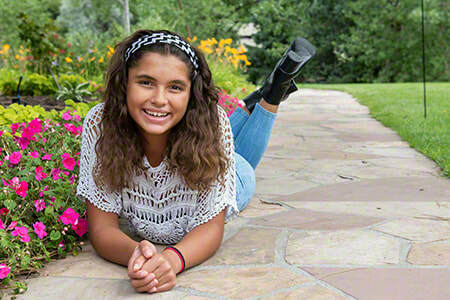 Many compliment Izzy on her polite nature and willingness to help out others, and she delights in the company of adults and peers. Performing is second nature to her, and she can often be found dancing or showing off her gymnastic skills. The stage calls to Izzy, and she hopes to become a movie star or singer some day. An ideal meal for her would include pizza with something sweet for dessert. Her favorite color is purple. A home in which Izzy can be the youngest child is preferred; however, her caseworker will consider all family types. She has significant relationships that she would like to maintain following placement. Financial assistance may be available for adoption-related services.